love the comment about flute playing - so funny. Utterly Adorable. Bit worried about the poor wee fellow's nose- looks like someone gave him a nasty nip. Is he playing an invisible flute??? I want one... not to eat tho! Look at his little feet! Oh my, he is lovely. He is the most adorable! My want for an otter has been replaced by pangolin! 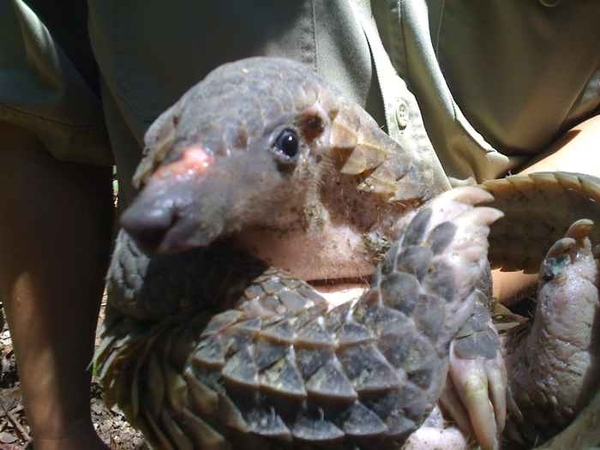 Mr Pangolin is using his hands to say "the one that got away was this big!" I'd use my tongue but... it's longer (he's not lying). He looks like he's having a little dance......."and shake it to the left!" Stephen Fry Like the armadillos in Texas, capable of digging up a home's concrete foundation. strange little animals. Stephen Fry Pangolin double take - OMG it's Stephen Fry! Adorable! As a Texan, I've got to say that it reminds me of a giant, elongated armadillo. Stephen Fry You could forgive that gorgeous beast anything it did! Even nuking the furniture or climbing the curtains! And that goes for the Pangolin too!! This creature looks like a natural performer but don't let cute looks fool you! Take a look at those powerful claws! I can't believe anyone couldkill a Pangolin. Look at those adorable eyes. They're heart melting. He is soooooooooooooooooooooooooooo sweet, he looks like a reptile version of Curious George! That is the most adorable thing I have ever seen. "WhatyoutalkingaboutWillis?" I see a new YouTube star. Move over Dramatic Chipmunk! I hope you didn't find him in the market under the sign "Tonight's Special"
In Panama, we used to buy up the iguanas and set them free, as they were otherwise destined for the barbeque. Adorable! I want one. Pleeeeaaaase? Something in his eyes makes me think he knows his picture will be beamed for the world to see! Awwwww! What happened to his snout? He's a lovely little thing!